I have taught myself not to be triggered by anger about many things in my life. I feel that we all could use a bit of compassion to those who we disagree with. However, I came across a picture that is making it way across the social sites and my jaw fell open. OK, wow. This is a very angry person. I understand they are wanting to be the tough love type. They are sadly misinformed and are quite judgmental. You are telling a person who has “mental issues” and possibly other disabilities to go and do things without regards to what they are facing might be. You are telling someone to take a shower or eat something more than a cracker because they need to accept the responsibility of taking care of themselves. Does this person not realize that most of us want to do this but we cannot? That we struggle to find the energy to get of bed and make it to the bathroom? That we are not sulking teenagers who are just lazy and don’t want to clean our room? This person is telling someone with mental issues to call friends and let them know that you are OK because they must be worried sick. Let that sink in for a second. You want a person who cannot make sound, mental healthy decisions to call someone for help. Not only do you want them to reach out, but you want them to apologize to others about how “I” don’t have the capacity or mental strength to do basic things in life. You want them to call and say that “I” need my space. Oxymoron much or is this going to be “crying for attention”? I weep when I read things like this. I understand self-care. I understand when it takes all you have to go and clean the kitchen and your body aches for the 2 hours it takes to get through it and you spend the next 2 trying to recover, but you do it because it needs to get done. Sometimes people need cute things to help them get the energy or confidence to take care of themselves. Sometimes we just need a security blanket to help us make it to the shower. Sometimes we need people to call US to check up on us and make sure we are OK.
Just because it may not work for you, why are you condemning it? I completely agree that making mental health issues cute is a terrible idea and does nothing to help the community. How is this person helping by belittling those who cannot take care of themselves BECAUSE THEIR BRAIN IS SICK! Now I agree that responsibility is something that the community needs. Acknowledging what you have and what you need to do to take care of yourself is a tremendous step in living with a disability. 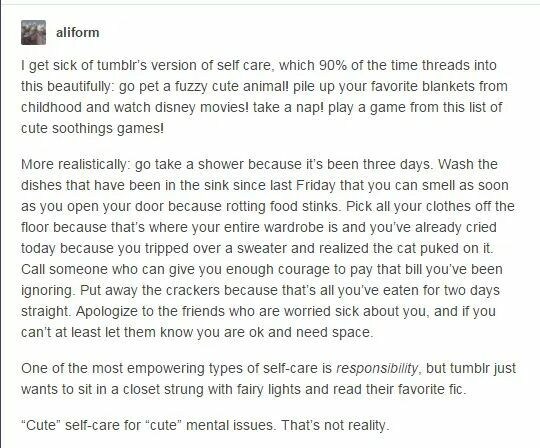 Cute self-care works for some however, why would you take that away from them? Why are you forcing someone to fight through all the pain, mental stress, and more to pick up the phone and call you to let you know they are OK? Tough love is a fine line. I feel this person missed it. By a wide margin. If you have someone that is like this in your life, please reconsider their role in your mental health recovery. You can find better people. I know they are out there.